Gordon Davies telling Henry that he doesn't have a hope of marrying Bronwyn while *he* has a say in it. KERRY: These are far more personal than anything we take from a book. JOE: I just don't want people laughing behind me back during the ceremony. KERRY (demands): Why have you gone so conservative on me *now*? JOE: It's not just *our* wedding, is it? I mean... it's Des and Jane: we don't want to spoil it. HAROLD: Why so Indian? Won't that be out of place with the rest of the wedding? KERRY: Oh no, no, no, no. Sky will be dressed as an Indian princess. Just wait ‘til you see what Joe and I are wearing. Nope, Toby's costume will fit in just perfect – won't it, Joe? Joe nods slightly uncertainly. Toby looks less than happy! MADGE: Right. Well, when he comes back I'm going to have a little talk to him. [To Henry] I'm going to make it clear to him that you're not the ratbag you appear to be! Henry mutters that he and Bronwyn are old enough to make the decision to get married without Mr. Davies' permission, so who cares anyway? Bronwyn, however, tells him that *she* does: if she got married against her father's wishes he'd probably never speak to her again. Turning to Madge, Bronwyn tells her that her father might listen if Madge tells him all the wonderful things Henry has done. MADGE (frowns): Yeah... I'm sure I can think of *something*...! MADGE: I'm not quick-tempered! Don't worry – I'll behave myself perfectly. DES: Did you hear that? Did you hear that, Jamie? She's coming home! She's coming home! MR. PUNCH: Hello. I'm looking for Jamie Clark. 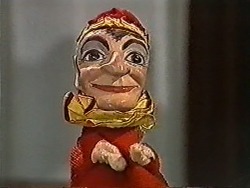 Des walks over to the door and tells Mr. Punch to come in. He grabs the arm the puppet is on and hauls Clive into the house! Clive has a Judy doll as well and he explains that he bought them for Jamie to prepare him for what might happen after Des and Jane have been married for a while! Des smiles that Jane just rang and everything is going ahead as planned! CLIVE: Crazy girl. I thought she was taking the chance to escape while the going was good! CLIVE: Would I do anything to ruin your wedding? CLIVE: You have got nothing to worry about! JOE: Geez, mate, I hope you're OK for the wedding. TOBY: I mightn't be. I don't reckon I should wear that costume – I'd be too cold, wouldn't I? My sneeze would get worse. JOE: You don't wanna wear it, do you? JOE: There's not much to it, is there? I mean, a kid with a cold: they should have more on than *that*. Yeah, they should have something *warm* on. TOBY: That's what *I* reckon. JOE: Yeah, I reckon you're right! TOBY: Good on ya, dad! With that, Toby gives Joe a relieved hug. 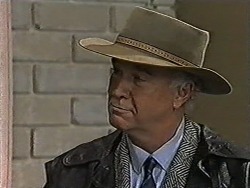 CLIVE: Don't you think you'll be right by then? TOBY: Did I do OK, dad? JOE: Yeah, sure, mate! But you've got to keep it up – we don't want to disappoint Kerry; but there's no way I'm going to make you wear that costume. This way we do it, we don't hurt anyone's feelings. Kerry has the Mr. Punch puppet on her hand and is entertaining Jamie and Sky, saying to Judy that it's very naughty to hit someone with their rolling pin! The doorbell rings suddenly and Kerry goes to answer. She finds Clive on the step and he explains that he's come to report back about Toby: he's not quite sure, but he thinks there's a pretty good chance he's putting it on. Looking surprised, Kerry remarks that that's not like him, and she asks why he'd do *that*. CLIVE: I get the impression it could be something to do with the wedding. KERRY (surprised): What – you think he's unhappy about it? She adds that she'd better find out, and she asks Clive if he could look after the kids, as Des has gone out to do some shopping. As she walks to the door, Kerry muses that it's funny: she's asking him to do favours and she hardly even knows him. Clive smiles that you don't have to ask him twice to look after kids: it gives him a chance to get down on the floor to play without anyone raising an eyebrow! KERRY: I hope you're going to well in time for the wedding. KERRY: Toby... don't you *want* your dad and me to get married? KERRY: Look, I know that Noelene's your mum. I want us to be real friends – *and* a real family – but if you're unhappy about that, then we'd better talk. KERRY: Well then, why don't you think you'll be well enough? Don't you *want* to go? TOBY (hesitatingly): It's not the wedding; it's the costume: it's yuck. I look like a real dag in it. KERRY (laughs): Well why didn't you say so?! DES: *Who's* a sitting duck?! Henry laughs at him that Joe reckons he's the one they should pull any fast ones on at this buck's turn. 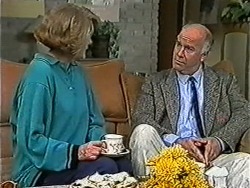 Des sits down and tells Joe that he reckons they should make *him* the target of all the practical jokes! JOE: Oh, mate, no way – I can cop anything *you* guys dish up! MADGE: Yes, the local hotel, where *I* work. GORDON: I suppose he drinks half the profits. MADGE (the calm beginning to disappear! ): He does nothing of the sort. Henry hardly drinks at *all*. You're not being very fair. Bronwyn clears her throat very obviously. Madge takes the hint and tells Gordon more calmly that she can understand his concern as a father, but Henry is determined to better himself and she's sure he's going to do very well eventually. GORDON: If that tape was any indication, I don't reckon he's going far in *radio*. *I* won't be tuning in, that's for sure. BRONWYN: A lot of people *like* that sort of humour, dad. GORDON: Look, the point is that Henry hasn't got any real prospects. Bron's studying, so how're they going to manage? MADGE: Surely a *lot* of young couples have to struggle when they first start out? GORDON: I was working on my father's farm; I had *good* prospects. [To Bronwyn] I wouldn't have married your mother if I *hadn't*. [To Madge] It's just that I don't want Bron ending up with some no-hoper. MADGE (snaps): Henry is *not* a no-hoper. Henry has tried very hard to get himself a decent job; it's not *his* fault that he hasn't been able to. As it is he's working as a gardener and a barman. It's not fair of you to put him down like that. GORDON: I just think he's a bit irresponsible – and not the sort of bloke I want to marry Bron. MADGE (angrily): Yeah, well, that's because you're an old stick-in-the-mud, isn't it? It's time you woke up to yourself: you've forgotten what it's like to be young. GORDON: I don't like arguments – and I reckon that's all we'll do as long as I stay around *here*. GORDON: An old stick-in-the-mud like me doesn't want to stay around when he can't see eye-to-eye with the lady of the house. Look, I don't mean to be rude, but there's no way I want Bron marrying into this family. I'll be out of your way directly. MADGE: Oh hell... me and my big mouth. Joe and Des are walking along the street, Des looking at the vows Joe has written. Joe remarks that he supposes Des and Jane are going for the more traditional stuff. Des, however, says he reckons they might write their own too. JOE: Good – we can all look like drongos together, eh?! 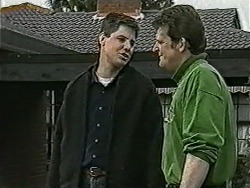 DES: Do you reckon you and Kerry will have any problems? JOE: You're joking! Probably have a million of them! You know what love's like: you know – you gotta work at it. Des smiles that they've got themselves a couple of great girls. JOE: You can say *that* again! I just can't understand why they fell for either of us, mate. We're just lucky we're such a couple of spunks! KERRY: You know, I thought *Joe* didn't care about what other people thought. He's got a bit of a hang-up about our wedding vows: seems scared to show what he really feels. CLIVE: A *lot* of people are. Maybe me acting like a big kid's just that; I don't know. KERRY: Yeah, I guess you're right. I think sometimes *I* hide behind the things I believe in. I mean, I really believe in them; it's just that I put them up to stop people seeing what I'm really like underneath. I don't mean to – I want to be honest. CLIVE: All we can do is try: the walls we build up take some knocking down. KERRY: I just hope I've been honest in *my* wedding vows. The first lot I wrote were *so* pretentious; but then I just tried to say what I felt. I honestly don't know if it's come across. CLIVE: The company was too good, mate – and I had a captive audience! HENRY: You're leaving because of *me*, aren't you? HENRY: Look, I know I got off on the wrong foot with you, right? I tried to make an impression and I only managed to make an idiot of myself – but I'd really like for us to find a way for us to get along together, because whether you give your blessing or not, I'm going to marry Bron. GORDON (coolly): Well we'll *see* about that. HENRY (snaps): Look, you can't stop it. HENRY: Bron, it's all right: we've got to lay it on the line, here; your dad's got to know how much we mean to each other. Now, we've already been through a lot, Mr. Davies, and I admit that I've got a lot of growing up to do – but I'm going to do it; I'm going to be a damn good husband. I will make sure Bronny has the best life I can give her, and if that's not good enough for you, well, tough. It's not going to stop us getting married. 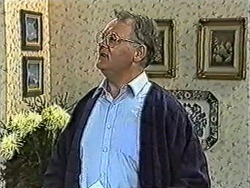 Harold tells Gordon that Henry doesn't mean to be aggressive; it's just that he feels very strongly about Bronwyn. Gordon nods that he can *tell* how strongly Henry feels, and maybe that isn't such a bad thing: at least he's got the guts to stick up for himself. 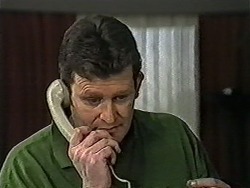 Bronwyn asks her father if he'll stay then. Gordon says he thinks it's best he shifts into a hotel, but he'll be back: he'll give Henry a chance to prove himself. Bronwyn looks at Henry in relief. KERRY: I don't think I can go through with this. DES: What do you mean? DES (looking astonished): I thought you were *over* all of that. DES: Look, it is pre-wedding jitters; that's all it is. I've got a bit of it myself: as soon as I found out the rehearsal was on Monday, my stomach was doing somersaults! I had to ask Clive to stand in as Best Man at the rehearsal. KERRY: Remember when I told you that I wasn't sure if what I felt for Joe was really love? KERRY: Well I'm *still* not sure. You see, just lately I've found myself attracted to somebody else – and if you feel *that* way, how *can* you really be in love? KERRY: That won't help. I don't think I can go through with the wedding – not when I feel like *this*. It wouldn't be fair to me *or* Joe. DES: You call it off, you're going to break his heart. Kerry stands there, tears streaming down her face.